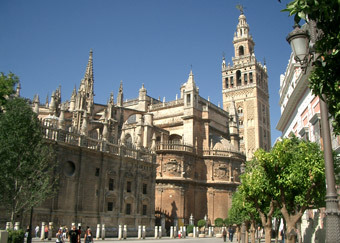 Seville online ES - The cathedral of Seville, Seville - Andalusia, Spain. 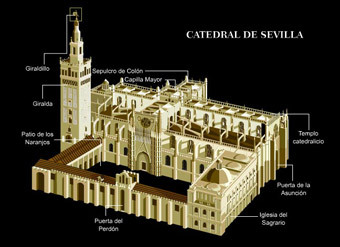 'Let us build a church so big that those who see it will think us mad', that is what the cathedral chapter decided in 1401 when the former mosque of Seville had to be knocked down. 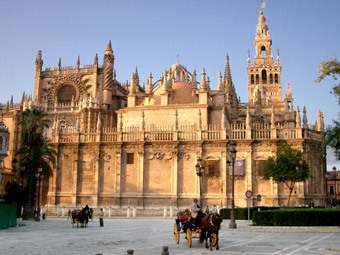 It is one of the last Spanish Gothic cathedrals, and the Renaissance style is already evident there. Its impressive size makes it the third largest in the Christian world, after Saint Peter's in Vatican city and Saint Paul's in London. The exterior shows particularly well the artistry of the unknown architect in playing with volumes and spaces. You enter by the Pardoner's door, formerly the majestic entrance of the old mosque and you will see another vestige: the peaceful Orange tree courtyard. At least once a year, during the Holy Week of Seville, the brotherhoods carry their floats in processions from their church to the cathedral and back. Inside the cathedral of Seville you will be struck by the size and richness of this universe of stone, stained glass windows and wrought iron work. The lightness of the columns accentuates the height of this hall-church with five spaces and lateral chapels. The simple crossing ogive vaults cover the nave except for the transept crossing where the flamboyant vaults stand 56 m tall. A mirror in the floor lets you appreciate the superb carving. Inside the Cathedral you can find the Tomb of Cristopher Columbus. The chapels of the cathedral. The capilla Mayor, of an unparalleled richness, is closed off by splendid 16C plateresque grills. Its immense Flemish retable gleaming with gold (1482-1525) is the largest in Spain (20 m high). The great sacristy, an attractive 16C room in the form of a Greek cross, houses the superb Renaissance Monstrance by Juan de Arfe. In the plateresque style, the capilla Real impresses by its size. Many other chapels and the treasure house allow you to admire some wonderful works by such as Murillo, Valds, Leal and Zurbaran. Photos of the province of Seville - Andalusia, Spain. than any other ski resort in Europe!